Sq. Ft.: 1,793 sq. ft. Lot Size: 7510 sq. ft. 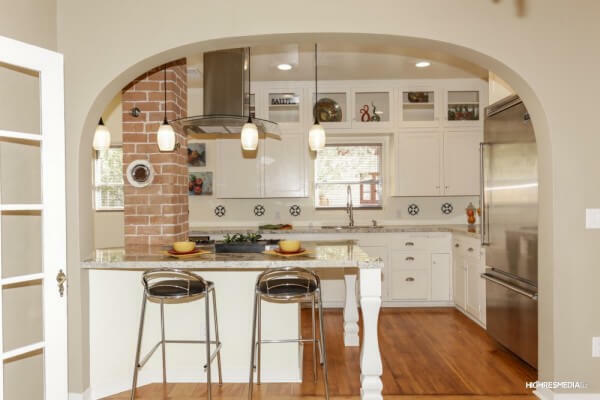 This gorgeous remodel keeps all the character and charm of 1930’s Willo District, but adds modern updates. Original hardwood floors, revised floorplan with three bedrooms. One bedroom can be home office with separate entrance. New master bath, and private master patio. Chef’s entertainment kitchen with new granite counter, seating, Viking 6-burner gas stove, built-in Viking refrigerator and Bosch dishwasher. Vintage original cabinets, with new lighting and glass. Original doors with glass door knobs, wood-burning fireplace, front porch and back patio. Single car garage would make a great guest house.